Smart Communications has new offer to all their subscribers who love to surf online using their mobile phones, broadband and laptops. With the latest BIG BYTES 50, you can now use its allocated internet data up to 3 days. From 350MB its now doubled 700MB of bandwidth at the same price of 50 pesos. You can also use 600MB of YouTube, iFlix video streaming and more. Check our details below about promo registration. To subscribe you can visit at your nearest load retailer to reload your Smart prepaid account. You can also buy online using your MySmart account, just make sure to link your Smart mobile number. From there you can also check the status of any promo you’re in and check balance at the same page. This DOUBLED Big Bytes promo is only available until June 10, 2016. 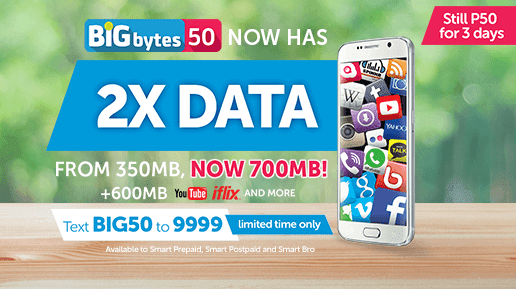 Bigbytes 50 is offered to prepaid, postpaid and Smart Bro users.